Have you gone out of your mind?! "Ben je betoeterd" is used informally and is a bit of a ‘friendly’ "have you gone out of your mind?!". As such it is often used to address children, as opposed to the stronger "ben je gestoord?!" or "ben je besodemieterd?!". It can also be used in the meaning of "don’t be daft/ridiculous". A common variation is "ben je nu helemaal betoeterd" ("have you gone completely out of your mind"). Note that "toeteren" is the Dutch verb for "to honk/blast/toot". – "Mevrouw, bent u nu helemaal betoeterd, wij staan hier allemaal te wachten en ik ben aan de beurt!" – "Zal ik je thuis afzetten? "- "Ah joh, ben je betoeterd, ik loop wel." – "Ben je nu helemaal betoeterd?! Wat heeft mamma nou gezegd, hier met dat koekje!" – "Ben je (nu helemaal) van de pot gerukt?! ": a popular more vulgar alternative to "ben je betoeterd". Literally it says "have you been pulled off the pot(ty)?!" . – "Ben je gek/gestoord?! ": are you crazy/insane?!. – Toeter: horn, blower [noun] [de toeter, de toeters]. – Toeteren: to blast, to honk [verb] [toeterde, getoeterd]. 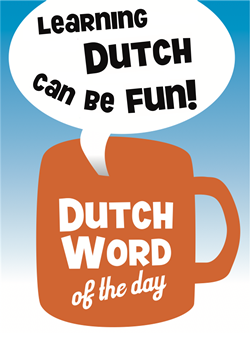 This entry was posted in Dutch phrase of the week, DWOTD 1.0, Vocabulary Intermediate by Sander. Bookmark the permalink. I do like this one! You should really check these expressions with Flemish people.. When you use this expression in Flemish it means “Are you drunk” or “under the weather” !! I wonder if it also means something different in South Afrika or in the Antilles ? When you say “have you been pulled of the pot(ty)? !” you mean “off the potty”. Thanks! I put in the missing ‘f’.